It was a game that most basketball fans love to see when the playoffs begin. Fast breaks, lead changes, the dramatic three pointer and an overtime victory for the underdog. The Lady Renegades from Shawnee traveled to Timber Creek to take on the Chargers during the first round of the South Jersey Group III girls' basketball tournament. Shawnee would dominate the first half and led by fifteen points at halftime. 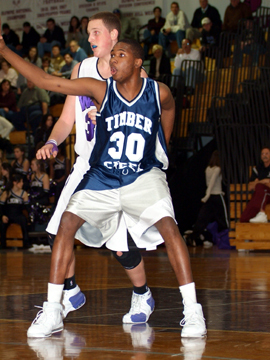 But Timber Creek charged their way back into this game and eventually tied this game forcing an overtime period. Trailing by two, Shawnee's Melissa Chu nailed a three pointer with 11.5 second remaining in the game to give the Renegades a 59-58 lead that they were able to hold onto. The tenth seeded Renegades' upset victory over Timber Creek advances them to the next round against Cumberland. There has to be something said about a team who has loss their star player due to an injury right before the upcoming state's basketball tournament. The Lions from Cherry Hill West would have to find other ways of putting points on the scoreboard after senior guard Ian Davis broke his right hand last week. After losing their first meeting to Timber Creek about a month ago, Cherry Hill West would jump out to a six point halftime lead in front of their hometown fans. Both teams struggled to convert on their scoring chances during the first half, but it would be the Chargers who would start the third quarter and take their first lead of the game. That momentum would be enough for Timber Creek to come away with a 43-40 victory. Seven different players scored for Washington Township, including four players with two goals each as the Minutemen rolled to an 11-1 victory over Timber Creek. Dave Moore, Marc Remini, Colin Davis and Christian Biscardi paced the Township attack with two goals each. Mike Schwer scored the lone goal for Timber Creek. Township jumped out to a 4-0 lead after the first period, with Remini tallying twice and Cameron Rowand and Biscardi joining in as well. Davis and Schwer exchanged goals in the second period, but Township exploded with six goals in the third period. Fresh off its spirited tie with Township, Clearview captured its first victory of the season defeating Timber Creek 3-2 at Hollydell on Friday night. Timber Creek scored the only goal of the first period just one minute into the game as Seth Pohle jumped on a loose puck and blasted home a shot. Clearview tied the game at 1-1 midway thru the second period as Joe Tropiano deposited a Shaun Stamm pass into the net. Later in the period, Stamm put Clearview ahead at 2-1 as he won a face-off and chipped the puck over the glove of goalie Chris Costa. Timber Creek out worked Williamstown in skating to a 2-2 tie on Friday night at Hollydell, as goalie Chris Costa stopped all 13 shots in the third period to help secure the point. Dennis Cunard scores both Williamstown goals, Marin Marshall and Seth Pohle scored the goals for Timber Creek. Williamstown scored the only goal of the first period, with Josh Haynes making a diving stop at the point to keep the puck in the zone, he found Justin Osterdahl in the high slot, and his shot was stopped, but Cunard was there to put home the rebound. Timber Creek did not muster much offense, electing to play stay at home defense and wait for a scoring chance. All of the preparation throughout the week done for a homecoming game can be exciting and a bit of a distraction for some of the players with so much emphasis focused on this high school event. On the other side of this situation, a player could be completely focused on their objective with this game and get pumped up knowing that a large crowd will be watching. The Eagles from Winslow Township definitely would achieve their goals as they were able to contain the powerful offensive minded Chargers from Timber Creek. In a battle between two teams from the Burlington/Olympic Liberty Division, the Eagles dominated both sides of the ball and were able to come away with the 30-0 victory. Ruben Johnson had two rushing touchdowns for Winslow Township. Christian Fleagle scored four goals and Christian Biscardi added two as Washington Township defeated Timber Creek 7-2 in South Jersey High School Ice Hockey League action. Mike Schwer scored both goals for Timber Creek. You knew it was not going to be Timber Creek’s night as right after the opening face-off, Fleagle scored on his first shot, eleven seconds into the game. Four minutes later Township had the man advantage and Biscardi deflected a point shot by Marc Remini into the top shelf and the score was 2-0. Every team needs it and it's priceless when a team has the opportunity to us it. Geoffrey Mock, junior runningback for Timber Creek, was able to use his speed and quickness to elusively make something happen when the play didn’t go as planned. On the first day of a brand new high school football season, the Chargers from Timber Creek were hosting the Lions from Cherry Hill West. On each of his three touchdowns scored during the first half, Mock's ability to find his way around the Lions' defense and allow his speed to do the rest. Timber Creek would pick up the opening night victory by outscoring Cherry Hill West 19-0 in a Burlington/Olympic Conference matchup. April showers paid us a visit for most of the day on Saturday and the meteorologist suggests that the area is in much need for rain. Caught in the middle of the rain drops were the teams participating in the Rohrer Classic Baseball Tournament. Burlington Township, Haddon Township, Lower Cape May and Timber Creek were the teams participating in this year's tournament. The preliminary round started off with Burlington Township taking on Timber Creek at one location and at the same time at another location, Haddon Township hosted Lower Cape May. With Haddon Township and Timber Creek advancing to the finals of this tournament, it would be the Hawks from Haddon Township outlasting the Chargers to win it all. Danny Cavallaro and Tom Hopkins each scored two goals and Gary Scott and Phil Rivello chipped in with a goal and as assist as Timber Creek defeated West Deptford 7-1 and won the Tier 2 championship at Hollydell before a standing room only crowd on Wednesday night. Timber Creek took control early as Scott scored just five minutes into the game while the West Deptford faithful were derisively chanting his name. Moment’s later defenseman Matt Walsh made a diving stop on a clearing pass by West Deptford, and Walsh floated the puck towards the net where Dan Lempa was stationed and his one timer made it 2-0. Luke DeHart scored in the opening minutes of overtime as West Deptford rallied for a 4-3 victory over Timber Creek and force a deciding game on Wednesday night at Hollydell to determine the Tier 2 Championship. Ryan Johnson led the Timber Creek attack with two goals. After the teams traded goals in the opening period, Johnson for Timber Creek and Mike Fleshman for West Deptford, both goal tenders controlled most of the game as Evan Betz and Derek Cafasso starred in nets. With the score tied at 2-2 entering the final period and both teams playing strong defensively, it felt like whoever scored next would win. Well Phil Rivello gave Timber Creek the lead with Dan Visco getting the assist and it looked like that goal would stand up. It all started with back to back wins against St. Augustine and Middle Township, two teams that previously defeated the Bulldogs from Bridgeton. 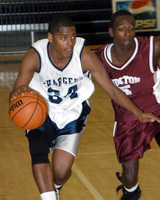 With their recent success and due to the rescheduling of the Olympic-Cape Atlantic Challenge, Bridgeton was called upon to replace Pleasantville during the sixth annual tournament held this year at Timber Creek. Bridgeton's Lee Frazier would find success during the fourth quarter to keep one step ahead of the Chargers from Timber Creek. Bridgeton would pull out the upset over Timber Creek by defeating the Chargers 66-58 for their third straight victory. Mark Lamberto is not hard to find on the ice, he’s arguably the smallest player in the SJHSIHL, but on Friday night at Hollydell, he was the best player on the ice, especially in the first period as Timber Creek defeated West Deptford 5-1. Five minutes into the game Lamberto sent in Tom Hopkins and his shot found the net for a 1-0 lead. Given a chance to tie on the power play minutes later, West Deptford was stoned by Derek Cafasso on a great scoring opportunity, and Lamberto picked up the puck and he flew down the ice with Phil Rivello and joining them on the break was Danny Cavallaro, Lamberto hit Cavallaro and his quick shot gave Timber Creek a 2-0 lead. 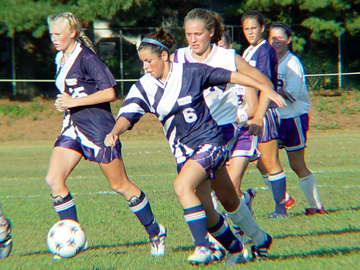 So far this season, Cherry Hill West has done what most had thought the Lady Lions soccer team could do. That is to win those games they were supposed to win and remain competitive on the field. That effort has rewarded the Lions with a four game winning streak to open the season. No team should ever be considered as an easy team to beat because there will always be eleven players on the field working hard. Timber Creek was that team standing in the way of West picking up their fifth win of the season. Arielle Caldas was responsible for giving the Lions the early lead in this Olympic Conference game. Cherry Hill West would pick up the shutout as keeper Kristen De’Ambra preserved the 3-0 victory.